Europe has hit Google with a record $5 billion fine. The company was ordered by the European Commission on Wednesday to pay €4.34 billion ($5 billion) for unfairly pushing its apps on smartphone users and thwarting competitors. 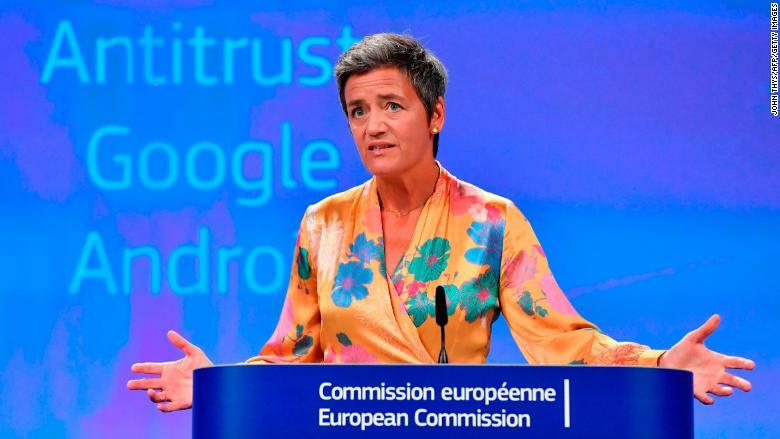 "Google has used Android as a vehicle to cement the dominance of its search engine," Margrethe Vestager, Europe's top antitrust official, said in a statement. "They have denied European consumers the benefits of effective competition in the important mobile sphere," she added. The Commission said that Google (GOOGL) broke the law by requiring manufacturers to install its Google Search and Chrome apps as a condition for licensing Google's app store. It said that Google paid some large smartphone makers and network operators to install apps on phones before they were sold. It also prevented manufacturers from selling devices running on alternative versions of its Android operating system. Vestager told reporters that the fine, the largest ever imposed by the European Commission, reflects the "seriousness and sustained nature" of the violations. Google has been ordered to stop the practices within 90 days, or face additional penalties. European Union Competition Commissioner Margrethe Vestager addresses reporters on Wednesday. 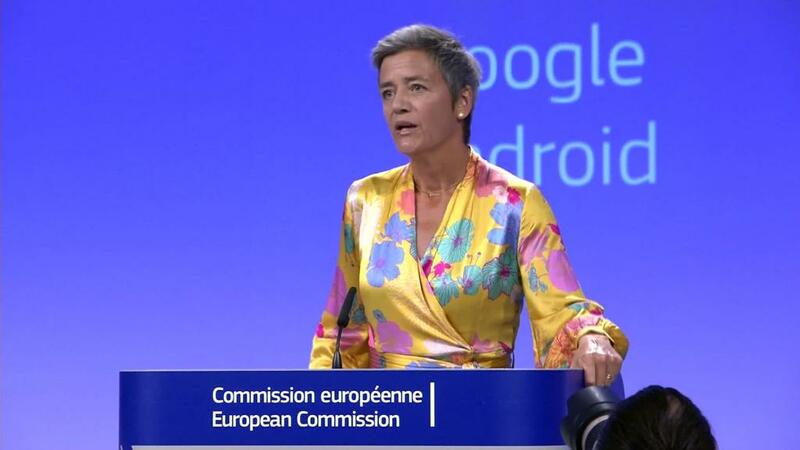 The Commission has been investigating Google's use of Android since 2015 after European and American rivals complained. It said that about 80% of smartphones in Europe and worldwide run on the system. Google said that it would appeal the decision. "Android has created more choice for everyone, not less," it said in a statement. "A vibrant ecosystem, rapid innovation and lower prices are the classic hallmarks of robust competition." EU regulators have taken a much more adversarial approach to big tech companies than their US counterparts, especially when it comes to competition, data protection and tax issues. Last year, Google was hit with a record EU antitrust fine of €2.4 billion ($2.8 billion) for prioritizing its shopping service over competitors in search. Apple (AAPL), Amazon (AMZN) and Facebook (FB) have also been penalized by European regulators. The Commission could have fined Google as much as 10% of the annual global sales of Alphabet, its parent company, which topped $110 billion in 2017.